Since she tagged any readers with brown hair, I’m considering myself tagged. The rules are easy: Open your photos album, navigate to the fourth folder then select the fourth photo in that album. 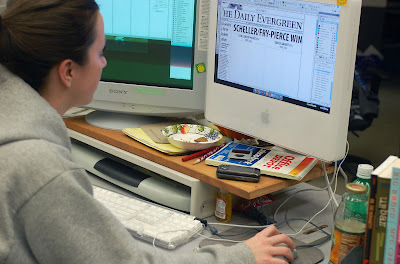 Here I am at my desk in the Daily Evergreen newsroom, being all copy editor-like. This was during the ASWSU elections. Go me for getting the front page that night. I was a copy editor at the Evergreen for the duration of my final year in Pullman. I loved it and it is, without a doubt, the main reason I applied for (and will start in six days!) my job now. You can see my caffeine supply (Mountain Dew and iced tea) to my right and my beloved Pantech Duo, now lost, in front of me. Oh, how I miss you, Duo. Also there’s my iPod (still in my possession) and I definitely still have the orange hand sanitizer and that Office Depot notepad. Thanks to… Lisa, I’m sure, for taking the photo.